Street food vehicles come in all shapes and sizes but we hadn’t seen a horsebox one till we met the Fancy Fox NI. Now we have, we realise what a super idea it is. It was the brainwave of husband and wife tea, Eugene and Lorna O’Boyle from Castlewellan, Co Down. 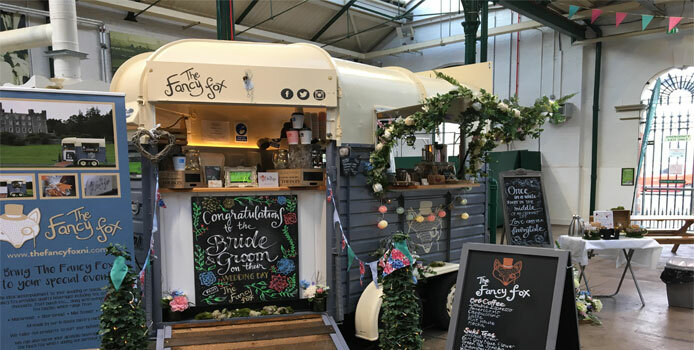 Their horsebox of choice is a Rice Beaufort vintage one which now transports gourmet coffee and treats instead of horses. They serve locally-sourced Bró Coffee. They picked it because they believe it the beans have the exact characteristics for that perfect flavour and aroma profile. They are also fans of the Belfast boutique blender, Suki Tea, who ethically source and blend juicy, loose leaf teas, herbal infusions and fruit blends from all over the world. In addition there are hand-crafted Fox Fancies. These are French-style cakes and treats like macarons, mini-scones, shortbreads and pastries made by their in-house chef. Naturally they are made using locally sourced ingredients where possible. They can supply these for food service and retail, too. They cover the country at various shows, festivals and corporate events as well as specifically catering for weddings. They are also available to hire for private parties, christenings, holy communions, birthdays and hen parties. The Fancy Fox is also available for private hire to serve your own alcoholic drinks.